The things I do for you, readers all over the world. The kind people at TomTom Sweden, and the even kinder people at their PR-agency (Cloudberry, thank you!) sent me this to review over the summer. Tomorrow I’ll try to edit an unboxing video which will be followed by a First Look and, later on, an in-depth review. Does that sound all right to you…?I happened to be sitting in my underwear, playing video games, when the delivery girl, a rather cute one as a matter a fact, showed up. 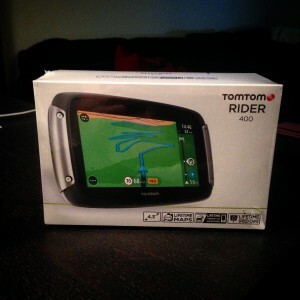 I barely had time to get a pair of old, ugly sweater pants on – no shirt though – to get my hands on the TomTom RIDER 400. That embarrassment is just one of the things I do to be able to give you consumer guidance on your quests to becoming world explorers. Anyways, it’s going to be fun doing this test. As a reference, we will use my buddy’s Garmin Montana 600 which so far hasn’t been able to show us the way anywhere. But it will serve as reference point regarding usability, ruggedness, functions, distance measuring and so on. Another good friend, who happens to share the Nite Ryderz garage with us, has lent me his tent and Therm-a-Rest mattress so now I’m soon all prepped up for an epic motorcycle journey next week. Within country limits, but Sweden being what it is, it’s going to be epic no matter what. Well, maybe not if it’s raining cats and dogs but otherwise. I was going to have my cam chain tensioner on the KTM 690 Enduro changed but getting hold of a repair shop in Sweden is like finding a needle in a haystack. You must be incredibly lucky to catch them at the exact right time, the two seconds they actually feel like answering. Man, there is room for improvement in this business, let me tell you that. So for now I’m stuck with the unnerving noise.